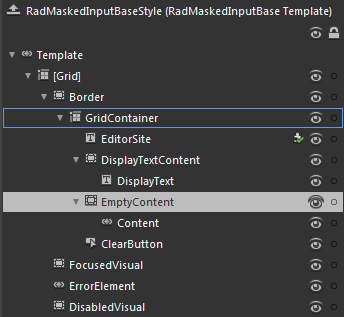 Like most WPF controls, the RadMaskedInput controls also allow you to template them in order to change the control from the inside. Except for templating a whole control, you can template only parts of it or even independent controls related to it. The style of each RadMaskedInput controls is based on a RadMaskedInputBaseStyle. This topic will make you familiar with the structure of the RadMaskedInputBase templates. Here is a snapshot of the template generated in Expression Blend.